Every Christmas Day, our local area newspaper publishes an editorial that is titled “Yes, Virginia, There is a Santa Claus.” It was written many decades ago to remind a young girl that Santa Claus is real and it is okay to believe in him. Last night’s stunning and historic American presidential election brought those words back to my own heart and mind–with a little twist. Prayers were answered. A miracle happened. Yes, Virginia, there’s a God in heaven. Against all odds, Donald Trump was elected last night to be the 45th president of The United States. He is a man who has never held public office or served in the military. He was not given any chance of receiving his party’s nomination, and after he triumphed over sixteen other highly qualified candidates, nobody believed he could really win the general election. But after nervously watching the vote count last night for seven hours, the unforeseen occurred. On the screen appeared the electoral vote count of 274 for Donald Trump and the announcement that he was projected to win the state of Pennsylvania. Within seconds, the screen boldly announced: Donald Trump was the new US President-Elect. Here are some observations of what happened on November 8, 2016 . I welcome your comments. 1. Donald Trump was not my first choice for president. He possesses some obvious character flaws. But he grew in presidential stature over the past year. He does have many admirable traits including a strong work ethic, good family, and an incredible business acumen success story. He will bring the greatest set of CEO skills ever seen in the Oval Office. I also believe he will grow is wisdom, character, and faith through the new responsibilities soon to fall on his shoulders. 2. This election turned out to be the American Brexit (Britain leaving the European Union). The people rose up against both the Republican and Democratic establishments and said with a loud voice “We want government of the people, by the people, and for the people.” The elites have been toppled and I’m sure many are wringing their hands and looking for therapists today around the DC Beltway. Trump will champion the common person and the reverse the trends of socialism and globalism. 4. The US Supreme Court will be stopped from destroying the US Constitution. President Trump will appoint constitutional literalists (in the spirit of Antonin Scalia) that will preserve the First and Second Amendments(and many others) while dispensing justice from a biblical point of view. In fact, it’s possible that President-elect Trump will nominate one to four justices–preserving the world’s greatest legal document (The US Constitution)–for a generation. This is an incredible win for freedom and rule of law. 5. After sitting on the fence for years, Bible-believing followers of Jesus turned out in mass to vote for the Trump-Pence ticket. I believe that desperation over American cultural demise motivated many believers to do their duty and vote. According to the FiveThirtyEight blog, evangelical voters were among the strongest demographic groups. Trump’s margin among evangelical white Christians was 81 percent to 16 percent. If that mark held, it would be the widest margin for a Republican presidential candidate among evangelicals since 2004. Over eighty percent of secular atheists voted for the Democrats. America is divided because two worldviews are battling for supremacy in the nation. During the Obama years, secularism reigned. The Church and American public finally woke up, and voted to reel us back away from the abyss. It’s a civic beginning of “If my people” (2 Chronicles 7:14). 6. I agree with Gary Randall that “God intervened in the direction the leadership of this country has been going and has allowed a flawed, non politician to be elected to the highest office in the world. This election impacts the Supreme Court for a generation or more. And reaffirms our religious freedoms. It is indeed an historical moment in the history of our country.” Many call Donald Trump a Cyrus candidate that God could use to take us through a tumultuous time. You might to view this video by Patricia King and author/business leader Lance Wallnau on the meaning of the Trump victory (done before the election). 7. It’s interesting to me that Trump’s first pivotal state was North Carolina–the home of Billy and Franklin Graham. I believe God greatly used Franklin Graham’s ambitious Decision 2016 tour to all fifty state capitals to call God’s people to pray. Over 100,000 attended and thousands gave their lives to Christ. One day before the election, Dr. Bill Graham turned 93, and on election day he and his son led America in praying for the election results. I believe their prayers were answered. 9. Donald Trump has changed the electoral map in our nation. He not only won back many “Reagan Democrats” from the Midwest, but also claimed more Asians, Hispanics, and blacks than did Mitt Romney four years ago. Those increases, plus the evangelical vote, were probably the difference. It seems like all sectors of American society woke up during Election 2016 and realized we badly needed a change of direction. 10. They will get it with the new administration. One of the more promising notes is a the wealth of great talent that Trump is sure to stock into his cabinet and government. Wouldn’t it be wonderful to see folks like Rudy Guliani as Attorney General, John Bolton as Secretary of State, Ben Carson as Surgeon General or Mike Huckabee as director of HUD? 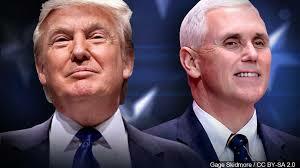 One of the greatest blessings of the Trump win is getting Mike Pence as vice president–one of the most principled and godly men on the political scene. Ronald Reagan chose great people to lead the country during the 1980s and God’s blessing was evident. I believe businessman and CEO Donald Trump will do the same. Yet, I know many people are hurting and discouraged after this election. I know their pain. Four years ago, when Barack Obama won his second term after lying about the Ben Ghazi attacks, I felt the same shock and disbelief. While on a trip to Texas, I took a long prayer walk in the east Texas countryside to cry out to God and ask his guidance. He showed me many things and dried my tears. And he gave me renewed faith that revival could once again come to America. I almost lost that hope in an American renewal a few weeks ago. Then God led me to begin praying for a tsunami of freedom-loving people to rise up and vote. “Let not your heart be troubled. Believe in God. Believe also in Me.” No human leader is our hope. We must keep our eyes on Jesus. “Occupy until I come.” What are your assignments to advance God’s kingdom on earth? “Go into all the world and preach the Good News.” In the end, good governments and nations are simply a means to peace and outreach. Let’s use this election to point many to Jesus. Excellent input and insight on the hand of God to receive our prayers and intervene on behalf of our nation. We need to continue praying for the Holy Spirit to move in the hearts of our leaders and direct the people to seek Jesus Christ. There are many changes to be made in the future and we need wisdom from Heaven to proceed. Praise God for His grace upon us. Thanks Ron for your faithfulness and encouragement to the Body of Christ. Press on for Jesus and His Kingdom. Beautifully spoken, Ron. Prayers are indeed being answered! Thank you for this insightful analysis. I agree with you that God has answered prayer and intervened is a wonder way. Now, I think increasing numbers of God's people can believe and trust that the USA can in fact experience another Great Awakening. Perhaps the Greatest Awakening and out pouring of the Spirit is in the near future.